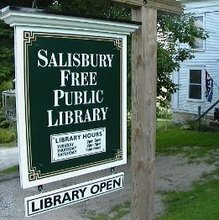 Salisbury Free Public Library: Holiday Party! 3:30 on December 4 (Sunday) Before the Tree Lighting! Holiday Party! 3:30 on December 4 (Sunday) Before the Tree Lighting! You are invited to the library for holiday music, cider and cookies, and a special story time for kids! This is a great annual tradition for all ages! And don't forget about the tree lighting that happens right after: we will have the horse drawn hay wagon come pick people up from the library to get to the tree lighting at 5. We have a parking lot in the back!